The Bertolini Sanctuary® Seating chair that was chosen for North Point Community Church is the Model Millennia 4015. The Millennia Series 4015 combines the ergonomic breakthrough of the Ergo-V back with the comfort of the no maintenance wood seat. Bertolini Sanctuary® Seating had the greatest opportunity to manufacture and custom build the Millennia chairs for North Point Community Church in Alpharetta, GA. "Bertolini is proud to have Andy Stanley's North Point Community as part of our portfolio of satisfied customers. They purchased 4,500 Bertolini chairs in the Winter of 2014 and they set up and stack their chairs 2-3 times a month. 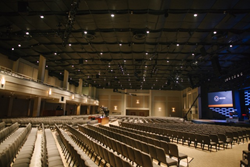 The church chairs are performing as designed and the Gwinnett campus also purchased seating for their auditorium. It is exciting to be a part of this most vital and progressive ministry", says Robert Wiltsey, Director of Church Sales. North Point Ministries, Inc., was founded in 1995 with the vision of creating churches that people love to attend. North Point Community Church is a non-denominational, evangelical Christian mega church located in Alpharetta, Georgia. The multi-site church currently averages more than 33,000 people in attendance between its six campuses each week, making it the largest church in Metro Atlanta. They offer adult groups, children ministry, school and college ministry. Each month, sermons and leadership messages are accessed over one million times via North Point websites. Bertolini Sanctuary® Seating custom built 4,500 church chairs for North Point Community Church and one of their multi site churches, Gwinnette Church. Gwinnette Church is located 15 miles apart from North Point Community Church. The Bertolini Sanctuary® Seating chair that was chosen for North Point Community Church is the Model Millennia 4015. The Millennia Series 4015 combines the ergonomic breakthrough of the Ergo-V back with the comfort of the no maintenance wood seat. It's multi-contoured V shape fits individuals all shapes and sizes by supporting the lower back while gently cradling the upper shoulders. Bertolini Sanctuary® Seating offers the industry’s strongest chair frame, radius 16 gauge 1010 cold rolled steel with integrated torsion bar. The frame finish offers an Ultra-Durable Powder-coat electrostatically applied and baked at over 400 degrees, saltwater tested to over 800 hours. Bertolini Sanctuary® Seating offers a large selection of superior USA built church, banquet, auditorium, classroom chairs and many other quality products. Their commitment to excellence shows in all of their products. From the quality of the materials they use, their innovative assembly techniques and rigorous testing process, the best church seating goes directly from them to the customer. With over 50 years of experience, the family-owned business has provided high-quality premium church seating to a variety of churches and companies.